The ideal starting kit, all you need is a hose and a tap. This Hozelock Multi-Spray Starter Set not only gives you the ideal sprayer that can be used for almost anything but all the connectors you would need all you really need is a tap and a hose. 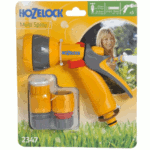 The Hozelock Multispray Starter Set has real easy of use whether it's a simple slide to intensify the water, a quick pull down of a lever to keep it spraying or a quick spin and click to change the pattern.